4Videosoft iPad 3 Manager for Mac is a professional transferring software, which can help you easily transfer various files between iPad 3 and Mac freely. It can transfer all iPad 3 files to Mac and Mac to iPad 3, like music, movie, photos, camera roll, camera shot, ringtone, TV shows, iTunes U, eBooks, ePub, voice memos, contacts, etc. Now, it supports iOS 6 and iPhone 5 and adds the function of digital signature, iMessage and contacts. 4Videosoft iPad 3 Manager for Mac can help you transfer all files from iPad 3 to Mac and iTunes and transfer files from Mac to iPad 3. Besides, you can transfer files among them freely when connect multiple Apple devices to Mac. This Mac iPad 3 Transfer totally supports all Apple devices. This iPad 3 Manager for Mac can transfer files for iOS 6 and iTunes 10.6. The Mac iPad 3 Transfer can help you convert any DVD and general video file to iPad 3 video and audio MP4, WMV, MOV, MPEG, ACC, MP3, WMA, etc. Besides, the powerful editing features can help you perfect the output video effect: trim, crop, merge, watermark, Deinterlace, etc. It is easy for you to make iPhone M4R ringtone from any DVD, video or audio file you select with the Mac iPad 3 Transfer. You can save all the converted video files to My Cache temporarily, then you can transfer them to your iPad 3 later. You can find the stored files easily by Genre, Artist and Album. 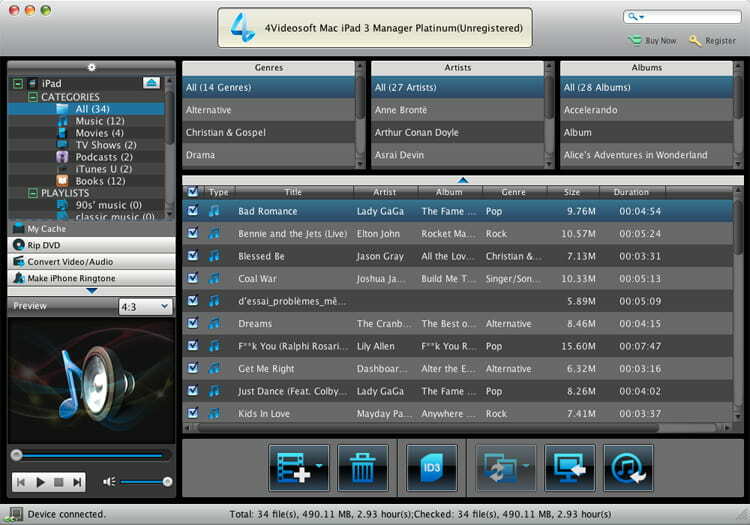 It provides you the ability to edit ID3 information, like name, artist, album, track number, lyrics, etc. This Mac iPad 3 transfer software help you repair your iPad 3 if the iTunes database of the device is damaged.